I stumbled upon some interesting information this past weekend: The author and screenwriter of Dances with Wolves, Michael Blake, has written a follow-up novel and is currently working on a screenplay adaptation for it. 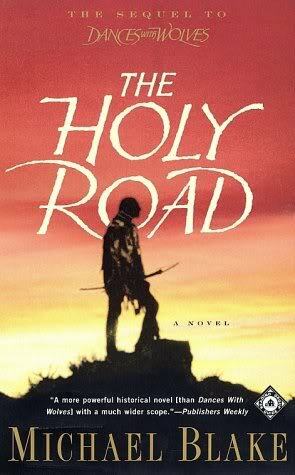 The Holy Road (2004), another epic tale, picks up where John Dunbar (Dances with Wolves), Stands with a Fist, Three Bears, Wind in His Hair, Kicking Bird and Smiles A Lot left off — deep in struggles with the white man in an effort to save the Sioux way of life. I have to admit to having mixed feelings about this development. While a part of me is seriously interested in buying this book, another part shrinks at the thought of reading the kind of novel Blake must bring to the table – one of struggle upon struggle, of terror and eventual diminishment for the Sioux. Really, do I want to sign up for such an unhappy story, regardless of how beautifully it may be written or its promise to reunite me with beloved characters? Or am I just brainwashed by the Cinderella Syndrome with its promise of happily ever after? What does an author owe readers, anyway? When you pick up a book, you’re signing on for a particular type of read. When you pick up a romance novel, you know you’re going to get chemistry, passion, love and definitely a H.E.A. You’ll expect a journey of some sort for the main character in most children’s books, a black moment and finally a H.E.A. (forget for a sec about Lemony Snicket…). I’d argue that fantasy and science fiction novels also have a built-in expectation for a H.E.A., as the typical setup for these stories is good vs. evil, with evil generally taking the fall in the end. Women’s fiction? Woman conquers demons, moves on to live a fuller, richer life. Mystery suspense? Good guys track bad guys, bad guys are caught, good guy gets a raise or a girl or a guy or something…but it’s happy. (Shh, I haven’t read very many mystery suspense novels.) Sure, there are exceptions to these standard formulas, but this is generally the way it goes. Which still leaves a lot of room for unhappy writings in lit fiction, historical fiction and just plain old gritty adult fiction. But even authors in these genres are likely to pull a H.E.A. out of their respective hats, because choosing otherwise usually means the protagonist fails in his/her goal – not a terribly popular formula with the masses. Then again, authors of The Thorn Birds (Colleen McCullough), Of Mice and Men (John Steinbeck), Lord of the Flies (William Golding), Gone with the Wind (Margaret Mitchell) and even my favorite, Time Traveler’s Wife (Audrey Niffenegger), embraced UN-H.E.A. and in doing so created classic works of fiction. And, of course, there is Lemony Snicket. Hmm, an open window. A new goal. A better tomorrow. At least sometimes. So what do you all think? Are you cutting the size of your potential audience by promising sadness and/or failure for your protagonist? As a reader, do you avoid books with an UN-H.E.A. or are you open to them? How would you compare your post-book experience with the traditional H.E.A. vs. the UNs? Do they make a more lasting impression? Do they make you think more? Or do they just make you want to throw the book against a wall? Chat amongst yourselves; I have books to buy. I love HEA’s. In fact, I get pretty depressed if I read a book where it’s NOT HEA. Since I like to read mostly for escapist reasons (unless it’s my history books on WW2 which yeah, did NOT end on a happy note for lots of people), then I want a HEA, I want to feel good when I finish reading the book. The gist I get from books and everyone else is that it’s okay to have an unhappy ending as long as there is some kind of tradeoff. Your Casablanca example is spot on. Rick doesn’t get the girl, but he does come away with something–at the very least a good feeling about the future. The hero doesn’t always get what they want. They might get something better in a more down-to-earth way. The H.E.A. ending works sometimes. I don’t care for it in the sports glory story because it’s too predictable. I like the trade-off ending like the ones you describe here. But sometimes, I need a good old fashioned Butch Cassidy going out in a blaze of glory ending. I enjoy the story that requires the reader to think about the ending a little. It’s nice to have an un-H.E.A. ending from time to time. However, I wonder if this reduces the chances of having a good-selling novel. Do the happy endings help friends recommend books to other friends? I wonder if this is why we don’t see as many Of Mice and Men or Lord of the Flies these days? I love HEA but can also love stories with bittersweet endings as long as there’s a point. In Romeo&Juliet type stories the feuding parties share the sorrow of the tragedy and (one hopes) learn from it. In The Time Traveler’s Wife we know Clare and Henry cherish each moment together, as we all should. The story I hated in school was Ethan Frome. At least at the time I felt there was no point to the suffering. Maybe if I were to reread it…no, there are already too many other books beckoning from my TBR list! Bryan, it’s interesting what you say about HEA helping to sell books. I am seeing the opposite in my book discussion group. Prevalent themes include illness, death, dysfunctional families, the plight of women in 3rd world countries. I get the feeling that some feel the HEA common in popular fiction is somehow less worthy. As for me, I’ve enjoyed broadening my reading but I go back to romance novels in between for balance and relief. I cannot say it better than Jennifer Crusie did in her article on Glee and Sympathy (hope this link comes through OK). ok, i’m being perfectly frank here: i have never watched Dances with Wolves because of the subject matter. I dread Civil War stories for the same reason – i know there is no happy ending. Even Gone With The Wind didn’t have a happy ending even though it was a great ending. But, on the other hand, I don’t regret reading Sophie’s Choice, even though the story was horrendous. But it was worth the read, for the sheer joy of the written word, woven by a great author. So, even though i love HEAs, sometimes we must take the risk and read a book for the pure joy of the read. I guess I’m telling you to buy the book, ter!